That man’s enthusiasm and ferociousness were obvious to everyone’s eyes. Although his red mantle had been ruined, the black lining accentuated his bulging muscles and ferocious limbs, giving off the thick air of wanting to seize the lives of his foes. With a decoration of a red string swaying at the pommel of his backward-bent sword, which is affixed to his hips, there are blood-spurts or something similar visible on the sword, resulting in it having a dangerous aura. On top of his neck, which had a golden ring coiling around it, he has a charming, manly face containing wildness within. That much is fine. Even Oiva will regard him as a reliable ally while thinking 「How dangerous」 if he goes that far. Previously he was hostile, but that changed into him having his skills trusted all the more. The chief of the bandits, Kustaa. Without a doubt, he is a strong person. 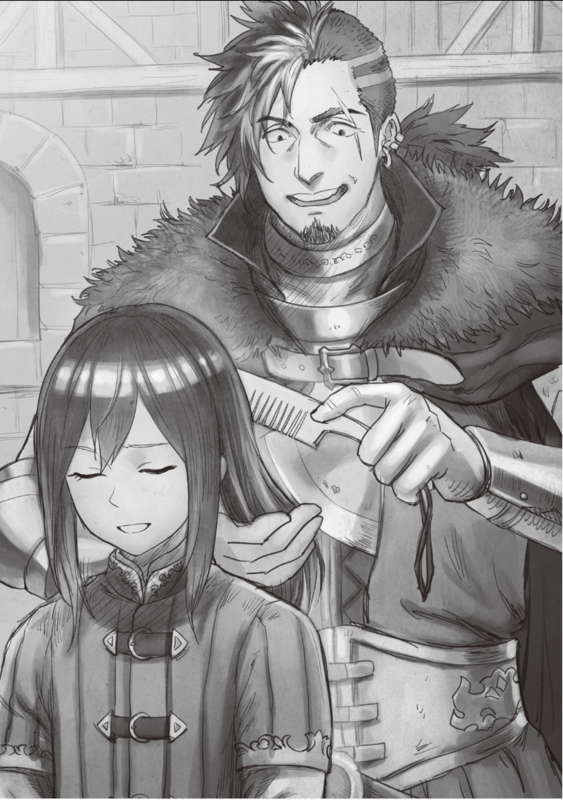 Why is he doing something like hairdressing with a smile plastered on his whole face? Oiva doesn’t know the reason, while observing it, either. His ability, which is splendidly put into practice, arranges politely and courteously the black hair while relying on a small knife and skilfully combing with a comb in compact tireless motions. The one who is sitting while that’s done to him is Marko. He has an expression of disagreement. What’s with this scene, I wonder? Oiva placed the sword, he was holding, to the side for the time being. More or less he was vigilant. Even while thinking that he must do so in the particular case of Marko, something like getting his windpipe slit due to negligence shouldn’t happen in these circumstances. Even if it’s the worst case. He didn’t expect that he would be seeing such a thing. This place is already the front line… it’s one among the many fortresses established in the Plain of Wandering Calamity. There’s still a bit time until we are scheduled to sortie, but it has been decided that we will start going ahead immediately due to the combination of our circumstances and the kingdom’s. Oiva was convinced. It looks like Marko plans to do everything that can be done. The idea of merging Kustaa’s 1500 mounted bandits with the Third Princess’ Royal Guard Unit is a story from a few days ago. It was something that happened soon after Oiva arrived at the front line fortress. It brought about surprise for the officers and men at the front due to two facts. First, it’s about them being quite the elite soldiers. All of the 1500 riders had an air of being dignified experts as light cavalry drifting about. The movements of every single horse and man possess sharpness and elegance, moreover, they are led without even the slightest unrest. As they were publicly three units of mercenary corps, many of other units came to inquire about the details of the contract. Every place is wishing for a powerful cavalry. Second, it’s about them arriving from north of the fortress. There are generally three ways to arrive at the front line fortress from the kingdom’s territory. The overland route heading North from the capital, passing through Helrevi Earldom and going East through Salmant Earldom. The overland route of crossing the river towards the West from the capital, passing through Marquis Yurihalshira’s territory and going South through Peterius Earldom. And the waterway going north on the Eastern Dragon River from the capital and then proceeding westwards on one of its branches. Something like a road coming from the North has been unknown. Kustaa stated 「We crossed through the northern border area」. Oiva heard the entirety of it from Marko. They arrived by using the “black market salt” route. How did the mounted bandits move with what objective? If it’s according to Marko’s concise explanation, it apparently was 「Disturbance of the front line’s war potential replenishment」. Intervening with the kingdom’s salt’s price with black market salt, the income of the national treasure was reduced in order to affect the war expenditures. Meanwhile, the supply line of the Helrevi Earldom was devastated and the flow of military goods was made to stagnate. Didn’t they delay the time of the war breaking out for two years as a result of that? Marko recited. Not just Oiva but everyone, who took the oath, was surprised by this even though they also agreed with it. They are aware that the activity of the mounted bandits in Helrevi Earldom was something that disregarded profit. That’s because they aimed at military goods even while braving danger. And, as for what turned the tables on them was for sure the mounted bandit subjugation. Black market salt and robbery. The goal of those two activities was likely to obtain vast profits as means and not as the property itself. If their goal was to simply obtain riches, it would have sufficed if they had just distributed the black market salt. There wouldn’t be even any necessity to be mounted bandits. Then, why did they want to delay the time of the war outbreak? Marko hasn’t talked about that. Putting thievery aside, the activity of dealing with black market salt might have been rather inconvenient in war times, but… the ability of Oiva’s intuition can’t grasp the answer to that. That’s because the degree of training of Kustaa’s group as cavalry is something inexplicable. Their strength isn’t in the area of them having acted violently because they wanted to do so. Originally the cavalry of Salomon’s army might have been their parent organization. However, why did they continue to preserve their strength for so long? Oiva daringly predicted the reason for that. Didn’t they wait for Marko? It’s a story that doesn’t make any logical sense, but the mounted bandit’s loyalty towards Marko gives Oiva such an impression. The persuasion of Marko’s sworn comrades to let him go to the mounted bandits, that bizarre scene, it seems to look like the origin of their loyalty. However, Oiva knows about a previous mystery. It’s Kustaa. At the time when Marko pierced Kustaa’s both shoulders… to be precise when he aimed to pierce them, I already saw one strange occurrence. The eyes of Oiva, who was very near, were able to perceive the matter of Kustaa being defenseless as he was obviously temporarily paralyzed. It’s his gaze. Marko releases dreadfulness from his blue eyes sometimes… it looks like it isn’t something that is effective against everyone, but… it hit Kustaa very hard. Oiva felt that. It was like that at the time with Bertrand as well. Oiva believes that he saw that strange coercion at that time, too. And it was odd to the degree of a leader of villains wanting to pledge allegiance. It’s no exaggeration to call him a fanatic and Oiva can sense the same atmosphere from the mounted bandits such as Kustaa. In reality, Oiva feels that they also entered the fortress without investigating it properly. At any rate, they are mounted bandits. It doesn’t look like they acted as thieves anywhere else but in the Helrevi territory, but even so, there’s something called bodies clad in brutality. It’s a military power different from mercenaries, who looked like it was business, or military which was regulated. It’s mixed with insanity like being driven through ferociousness. Ahead, where Oiva stared at, there are people who are receiving special treatment amongst the first unit of the mounted bandits. They are marked by a red cloth wrapping around their necks. Each and every one of them makes Oiva, as a soldier, feel that they have a level of capability making him put himself on guard. On top of that, each of them stands still with some sort of martyr-like serenity. There’s 99 of them. 100 if Kustaa is included. They are the former prisoners who headed to their village together with Marko. They have passed three years together with Marko and have now once again appeared in front of Oiva’s eyes. They are opponents he crossed swords with on one occasion, but Oiva doesn’t think that he wants to carry out the same thing with them now. He had a mental state of flatly refusing that. Making them and the Royal Guard Unit mesh with each other isn’t simple. Realistically the troops organization at this point has become something peculiar. The one organizing them is Marko, thus there’s isn’t a single person who complains. 500 riders, with all of them being formerly feudal army cavalry, are led by Akseli as heavy cavalry. They have been fully equipped with armours, helmets, long-handled spears and rider’s bows. They are expected to mainly move in cooperation with the infantry. They are the 500 riders who should become the core of the whole army. 500 low-ranking soldiers, with all of them being formerly foot soldiers of the feudal army, are led by Jarkko as spear infantry. As their style of equipment designates them as heavy infantry, they repeatedly trained forming an iron wall with their pikes and shoulder-high shields. Judging from their appearance, Oiva deems these 500 soldiers to be the most difficult for cavalry to break through. 500 people with a style that can be called “Jack of all trades” or something along those lines completely consisting of the former Hakkinen Guard Corps led by Oiva. Were they called a multi-purpose unit? As a unit their special skill results in digging holes but individually they are a gathering of ruffians who are carrying tools and holding bows. They have just advanced from being originally mercenaries, therefore there are many among them whose trait is to be strong in individual battles. And there are the 1500 mounted bandits as light cavalry led by Kustaa. Marko will be included there. No, him joining them is out of the question, Oiva reconsidered. The overall command lies with Kustaa, but Marko will form a unit of 100 riders directly leading 99 riders from among those. They are the aforementioned 99 red-clothed riders. Their war potential possesses something that makes even him as an ally shudder because of the 100 riders. Remembering the 100 riders on the battlefield, Oiva muttered 「How scary, how scary」. The one who called out to him in a carefree tone is Akseli. It’s the man who is entitled to work as leader of the Royal Guard Unit. The eyes of Akseli, who evaluates them in such way, don’t have their usual colour of enjoying the world. They are sharp. There’s something making him put up his guard as a person towards those red-clothed people, obviously coercing his tension to what he sees as sharpened blades. The other mounted bandits are better able to fit in with the unit, but that’s probably impossible for those 99, Oiva believes. He began to gaze at Marko in a manner of having a keen interest in throwing in the towel as it looks like Akseli’s judgement is the same as well. At the place of the 13-years-old boy, who gathers the attention of the unit in various meanings, it looks like the arranging of his hair has finally finished. Before the battle, his hair was fastened behind. The fastening string is red golden and Oiva discovers Kustaa’s obstinacy in there being a two-coloured braid. Marko came walking while touching his hair. His lightweight equipment, that still doesn’t include armour and helmet, gently envelops the flesh of the keen and nimble boy. A sharp sword is affixed to his hips… coupled with a sword ornament bestowed by Earl Helrevi, it had an elegance that can’t be described very well. Oiva’s ears catch voices of admiration leaking in the surroundings. Akseli answers with a broad grin without minding the surroundings. This man, who boasts of being the first retainer of Marko among Marko’s followers, is careful in his work concerning everything. By the way, for Oiva Bertrand is considered to be the first one to have taken an oath of lord and retainer with Marko, but the point made by Akseli was his interpretation of not counting believers since they aren’t retainers. Oiva looked at the two, who giggle together, with a slightly astonished feeling. It’s not about the previous words of Akseli, but he thinks that he doesn’t want to turn such a human into an enemy. He sighs greatly. A large quantity of military goods for the Royal Guard Unit arrived from the Marquis Yurihalshira household. It amounts to quite a lot money if the workers, horses and cattle to carry those are included. Moreover, it’s a lavish hospitality since war funds have been provided in addition to that as well. For the Royal Guard Unit, which was able to sufficiently put in order the preparations for the battle even without that, it was just a shriek of delight. Yes, the Royal Guard Unit has prepared everything for this day, this time. It was a schedule that isn’t objectionable even though it’s an unreasonable, sudden demand, but it was within the range of their forecasts if it’s Oiva’s group. This time’s dispatch of the Royal Guard Unit to the front line is according to the king’s decree. Basically, the Royal Guard Unit is groundlessly listening to the order of someone other than the Third Princess, but they are obliged to accept the current matter because it’s a decree connected to the bestowal of a fortress. The condition will end up becoming inadequate if they don’t put the saying 「Make use of your bravery」 into practice. However, Marko implemented a plan enabling them to carry out that decree. Its details have suffered many minute divergences, but the basic route is an act of provocation towards the First Princess. The Royal Guard Unit is an eyesore to begin with. It seems to be so because they are the guards of one princess right after their establishment. Just after that, they ran around provocatively. Even after being stationed at a fortress near inland waters, Marko advertised liveliness and eagerness pointing at something. While using the fame, he beautifully obtained himself, he created rumours and mingled those into Chitoga City. The Royal Guard Unit offers its adoration to Princess Paulina as the one and only true royalty and longs for the opportunity of service and devotion to sacrifice their own bodies… Oiva can’t do anything but laugh after it has become like this. If pushed to say, it’s because I’ve heard that the princess is a noodle artisan. The supply line from the East by going through the Helrevi territory is close to perfect. Was this something foreseen with the activity as Hakkinen Guard Corps? Oiva was appalled. The distribution and management of goods by Lauri is thorough. A thank-you-letter was passed on from Earl Helrevi because he achieved everything in accordance to the excessive account books. Since it’s been rumoured that it has lately become a shop that deeply impressed the Earl, Marko’s remark 「Please don’t head-hunt him as a government official of the territorial administration」 isn’t exaggerated, Oiva believes. In regards to the waterways, originally it has been expected for them to cause big problems. That’s because it reached the point of strict inspections being carried out even if it’s cruising formalities, making the management of ships all of a sudden troublesome. Because those are carried out by civil officials of the central government dispatched from the capital and not by civil officials of the Marjanta territory, who had been won over, we should be pressed into a painful choice with something as Royal Guard Unit. Moreover, there’s the cleaning up of the frequently appearing brutal river pirates. However, once the boss of the river pirates became a follower, it became easy instead. The river pirates, led by Bertrand, rampaged greatly and smuggled most of the stolen goods to the Helrevi territory. Even if the route was different, the goods were delivered and just its prices were left in Bertrand’s hand. Once it became like this, the rest was easy. The share of the Royal Guard Unit is borrowed from among the stolen goods and the profits of the smuggling are allotted to the war funds. Without using the fortune concealed in Lauri’s management, the Royal Guard Unit steadily advanced its preparations. Something like the transport of 1500 people was carried out with a carefreeness of mixed humming. Who will travel by smuggling and who will travel by a regular ship, once it was decided by lottery, it was finished. Looking at the two where one can’t see whether they are trying to play around, Oiva sighs once again. He is troubled by the difficult circumstances, but it’s unacceptable for him to slacken his feelings of tension because they have such composure. Those words, alongside a smile, spread within the autumn breeze after tickling his ears. Let’s see how long until his 2nd life ‘recruits’ find out who he was in his 1st life and become as zealous as his 1st life followers. Bandit hairdresser or hairdresser bandit? With earrings and a collar, and black and red clothing, it seems Kustaa wants to dress Marko in a style that matches his own. Like having a cool and brilliant son lol.